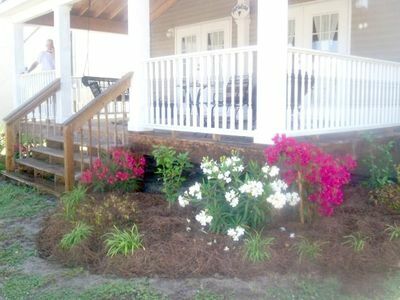 Sunrise 1902 - Spring availability – won’t last long! Feature: Beach Chairs & Umbrella (Seasonal-Free). 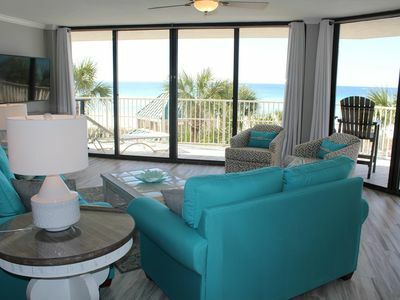 Sunrise Beach 1902 is professionally managed by ResortQuest by Wyndham Vacation Rentals. 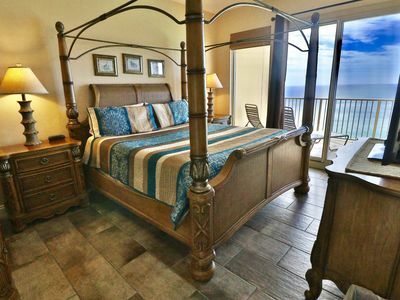 Step into paradise when you stay in Sunrise 1902. 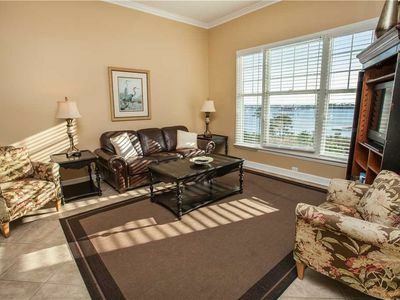 This two-bedroom, two-bath condo boasts comfortable, coastal décor throughout, providing a truly relaxing atmosphere. With a king-sized bed in both the master bedroom and guest bedroom, a twin-over-queen bunk bed in the bunk room and a pull-out sleeper sofa in the living room, Sunrise 1902 accommodates up to nine guests comfortably. Upon entering, you will find the bunk room immediately on your right, including its own flat-screen television and DVD player combination. To the left of the entrance is the guest bedroom, also including its own flat-screen television and DVD player combination. There is a guest bathroom next to the bunk room, which includes a single vanity and tub/shower combination. Further down the hall on the left is the laundry room, featuring a washer and dryer combination, for added convenience. 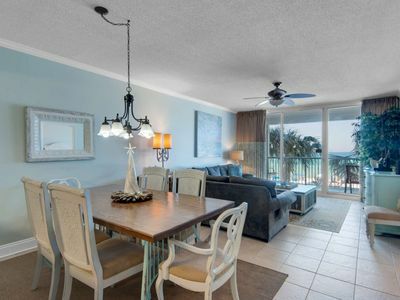 The fully-equipped kitchen includes plenty of storage space and all utensils and kitchen appliances needed to cook your own meals while on vacation. The kitchen opens into the dining area and living room. The living room includes a flat-screen television and DVD player combination and leads out onto the spacious, private balcony. 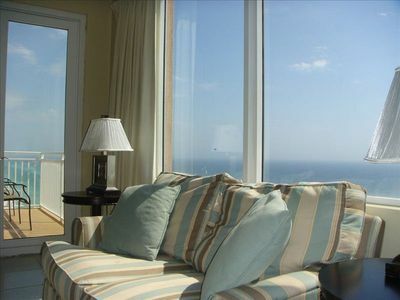 The balcony boasts incredible Gulf-front views of the Gulf of Mexico and is also accessible from the master bedroom. 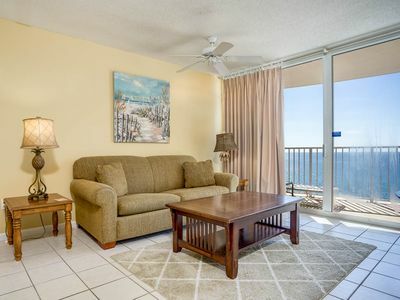 The Gulf-front master bedroom is located off the living room and offers a relaxing atmosphere with cozy décor, stunning views of the Gulf and a flat-screen television and DVD player combination. It leads into its own en-suite master bath, featuring a double vanity, large garden tub and walk-in shower. 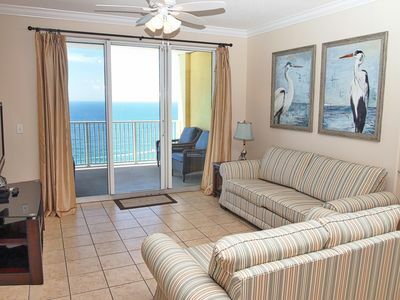 Make Sunrise 1902 your next home away from home and it can easily become your vacation destination for years to come. 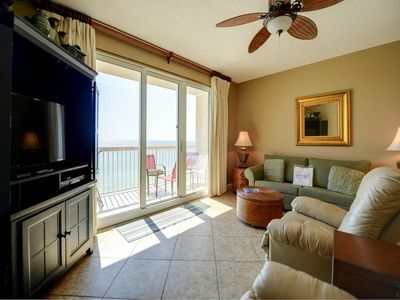 Sunrise Beach Resort boasts luxurious amenities, perfect for the whole family. 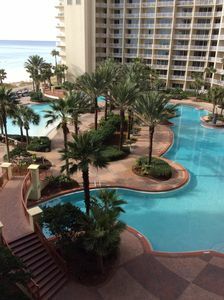 Make a splash in the two elevated Gulf-front pools, one heated seasonally. 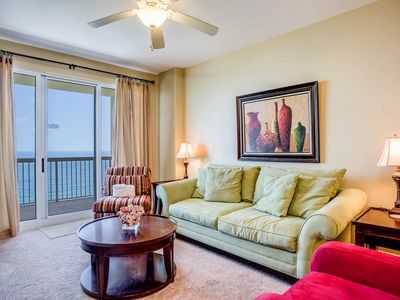 Relax in the two on-site spas or soak up the sun on the large sun deck. 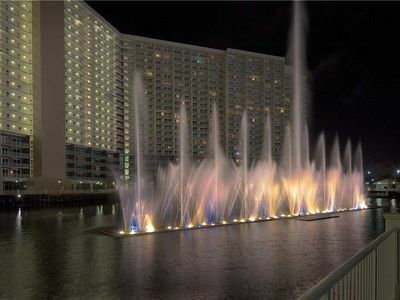 There is a spray park for the children, along with a Gulf-front exercise room and separate theatre. Enjoy the gas grills, perfect for a family barbecue. Take advantage of the underground parking as well. 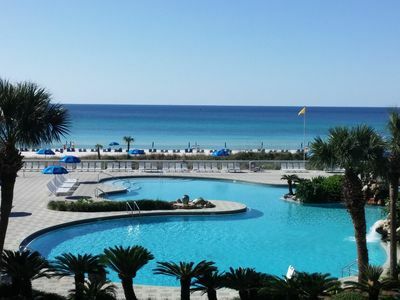 Dip your toes in the 330 ft. of beautiful private beach, just steps from Sunrise Beach Resort. Aquatic Adventures, the on-site seasonal beach service, provides the complementary beach service, as well as rents jet skis, catamarans, paddle boards, banana boat rides and parasailing. 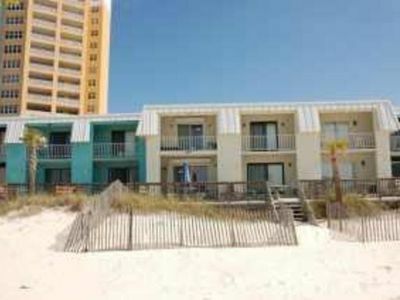 Sunrise Beach Resort is located in the hub of Panama City Beach, just 1 mile East of the shopping and entertainment of Pier Park. Aaron Bessant Park is also just a mile away, and is the venue for a multitude of annual events and festivals, perfect for a family adventure. Take a short drive to Frank Brown Recreation Center or Gulf World Marine Park. Enjoy the wonderful local cuisine offered in the surrounding area. 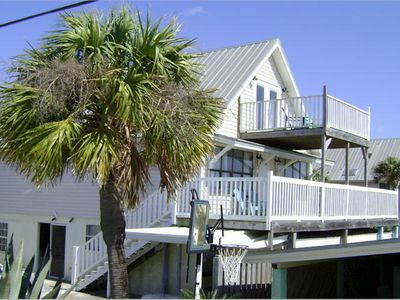 Explore, adventure and truly live like a local when you stay at Sunrise Beach Resort. Seychelles 0702 - Don’t miss your spring vacation. Book now! 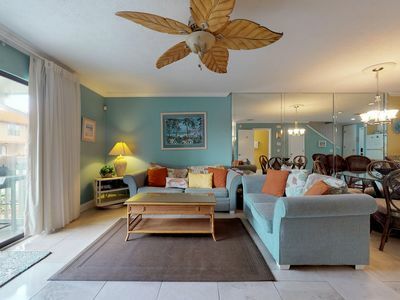 Fantastic 1 Bedroom @ Long Beach Resort, beach, view, pool and more! 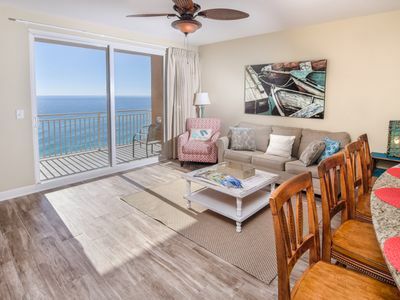 Luxury 3Br/2.5Ba Unit 523 W/ 5th Floor Parking & Double Balcony!!! 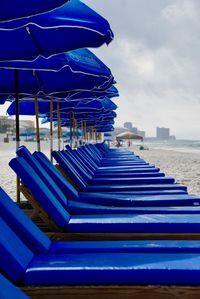 **FREE BEACH CHAIR SERVICE 2 LOUNG CHAIRS W/UMBRELLA! 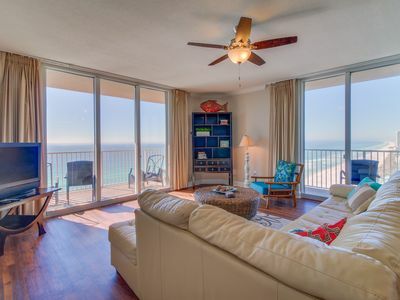 ** LOWER FLOOR, GULF FRONT! 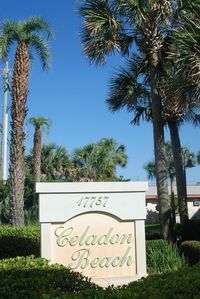 Beautiful 2-Bed Townhouse on the East End of Panama City Beach!